We wanted to travel – but where? Alex and I had been carefully hoarding our vacation days all year, but now it was early summer, we had to decide where to go. The whole world was open to us for two weeks. My own criteria were simple: somewhere we wouldn’t need a car, and somewhere not in Northern Europe or America. After all, over the past three years, I’d traveled to Iceland, Belgium, the Netherlands, and Germany, and driven across much of the US. It was time for a change. Alex’s criteria were equally straightforward: somewhere outside of South America. Having traveled to Mexico in the past, she wanted to see something more exotic… and maybe even cross the Atlantic. These were broad criteria, leaving the vast majority of the world to choose from. We had to develop some heuristic to limit the options. With only two weeks available, the major constraining factor was time. That eliminated Asia and much of Oceania. You don’t want to spend 16 hours flying back and forth all the way around the world, and then be so jetlagged you can’t do anything. I’ve worked with many people who have families in India, and by and large, they guard their vacation days even more jealously than I do, carefully scrounging together enough to disappear for a month. This simple decision eliminated half the world. Next, we preferred somewhere with a reputation for safety, so decided to leave out much of Africa and the Middle East. Of course, I would love to visit eventually, but these aren’t a great place for novice tourists! Now, we selected areas with the most to do: England, Istanbul, and Italy were the top choices – and Italy won out because of the overwhelming amount of travel choices, the resources available, and the sheer convenience. As time went on, and we assembled books and trawled websites, the options within Italy itself grew daunting. We composed a huge google doc with links, priorities, and notes. There’s a ridiculous amount to do in the country. 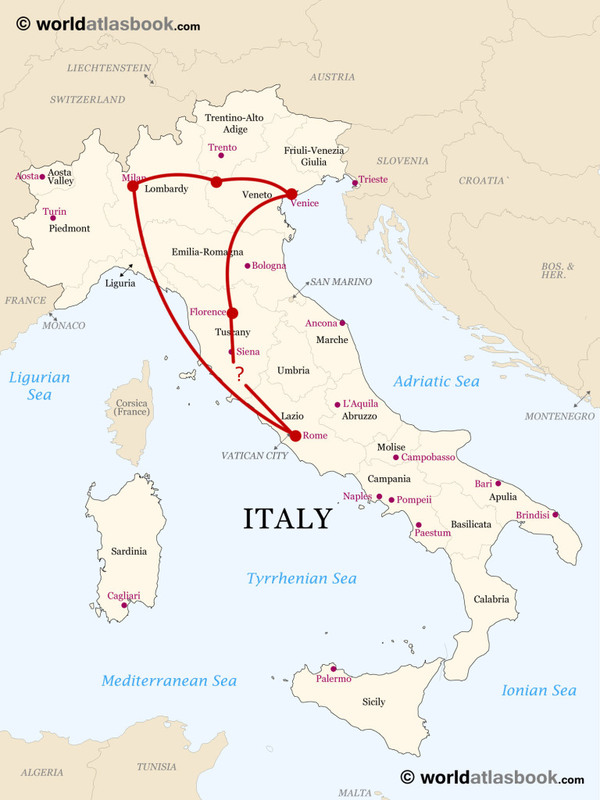 Consider: seeing the snowcovered Alps and Suedtyrol; boating around Venice; strolling the Roman forums; traveling to the sunny isle of Capri; seeing the preserved remains of Pompei’i; sleeping in the ancient caves of Matera; traveling along the Mediterranean and seeing Sicily or the chain of interlocked villages in the Cinque Terre. Not to mention the microstates of the Vatican and San Marino, the artistic masterpieces of Florence, the hilly streets of Siena, and dozens of other little sites that dot the country. 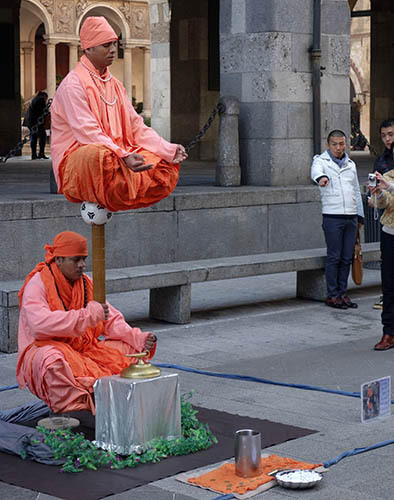 Milan – because the cheapest flights go there. Verona – as a smaller stopping point before Venice. Venice – because it looks damn cool.
? – a two-night gap to go where we wanted. Milan – to fly out again. Now we just had to find the time. 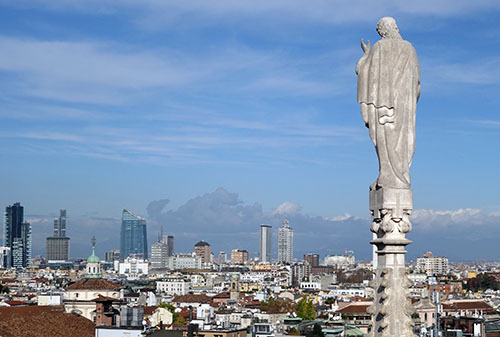 Alex was busy through November, so we were looking at that timeframe – and in September, cheap tickets popped up online: $500 round-trip to Milan. Done! Tickets booked, it was a waiting game. We did more preparation, particularly at the end of October, booking rooms on AirBnB. But there’s only so much preparation you can do, and only so tightly you can schedule a trip. I prefer to select sites the day before I visit them, according to my mood, so that’s what we did here. Finally, after an interminable wait, the day arrived. We wanted to travel light, not to worry about luggage, so I selected the least amount possible. This method of travel has served me well in the past. 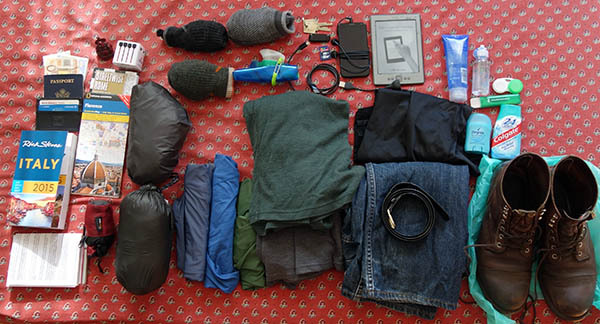 No possibility of lost bags, no standing out as a tourist, and no need to check into hotels early. Bag packed, I said goodbye to Miko (a neighbor would be watching her), and headed into Manhattan. Two weeks of supplies. Not pictured: bag, camera. I’ve found little as liberating as stepping out of the apartment, with only a backpack, headed for another country. It feels like an inside joke, as I walk pst people who have no idea I’ll soon be on another continent. I met Alex in the subways near Penn Station, and we headed towards JFK. Unfortunately, there were some construction problems with the line, and the train stopped somewhere that wasn’t JFK, so we ended up taking our first gypsy cab ride. I suppose it’s something you’ve gotta do if you live in NYC at some point, right? The plane was delayed. Of course. There were no announcements and we ended up waiting an extra hour in the airport before we could board. And when the boarding officially began, everyone rushed to the woman checking the tickets, no queue or organization to be seen. 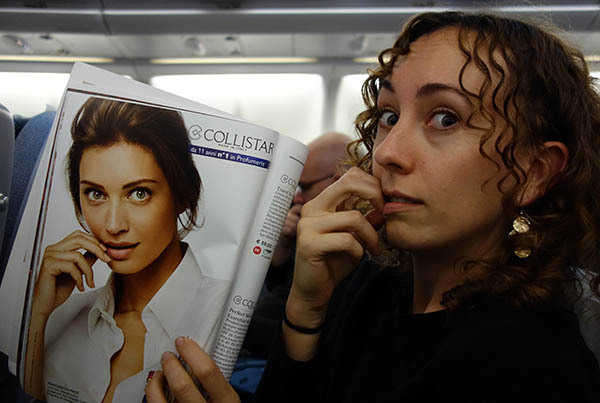 The man next to us chuckled at our confusion (and our frustration with the delays). “These are typical Italians,” he laughed. He was, of course, Italian. I’ve found Italians, by and large, to be wonderfully self-deprecating and conscious of their stereotypical faults – namely, a lack of timeliness and a charmingly self-centered disorder. The flight was 9 hours. We had a lot of wine and watched X-Men: Days of Future Past together, on the little seat-back screens. They fed us three times. It was good, insofar as a flight can be good (ok, it wasn’t the Singapore Airlines Suites). Finally arriving in Milan, we made our way out of the airport. It’s 30 minutes to the center of Milan via commuter rail. The train departed from under the airport and headed to the center, surrounded by large banks that obstructed our view of the countryside. I could tell Alex was anxious to get a look outside; I was anxious for her to see Europe (and of course, to see Italy for myself). We got some hints of the countryside – large flat fields, the industrial side of towns, tiny little houses. It reminded me of parts of the Netherlands. Finally we pulled into Milan. A city of 4 million, it’s the 7th largest city in the EU. 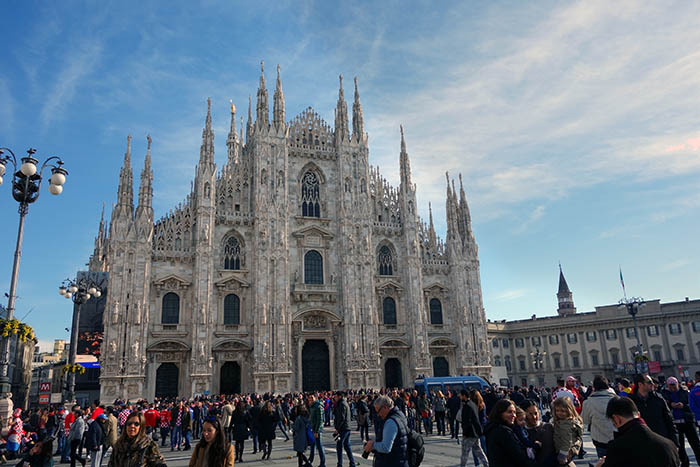 Despite its size, it doesn’t have a lot of tourist sites: the Milan cathedral and Da Vinci’s Last Supper are the best known. The city has a business-like, no-nonsense air. Outside the tourist quarter, we found quite a few restaurants where nobody spoke English. It’s known as a financial and fashion hub, has wide streets, and as a result it felt a great deal like NYC to me. We only had a few hours before heading to Verona, but thankfully the few main sites are within a few blocks of each other (we returned briefly on our final day to see a bit more). 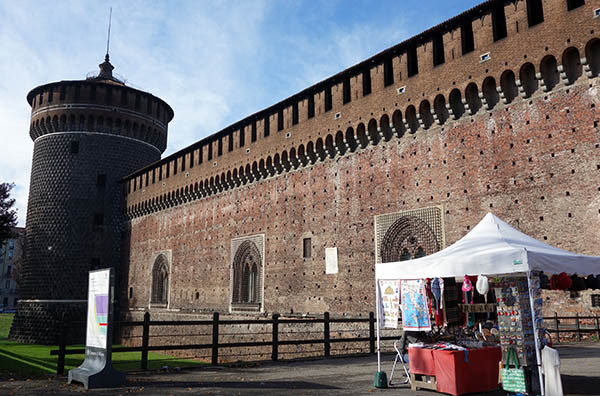 Literally two blocks from the train station (Milano Cadorna), and anchoring the city’s central park, is the huge Sforza Castle. There was some kind of book conference there – we got to see how Italian publishers sell their books (the same way American publishers do). Despite the fact that Milan isn’t very touristy, and this was the off-off-season, the castle was quite popular. You could wander inside and see the grounds, for free. There were several museums which we opted to skip, and a few tourist stands outside that we walked past. I liked the castle, which was forthright and square, and which must have been imposing in its day, but which now felt like a nice cultural hub of the city. 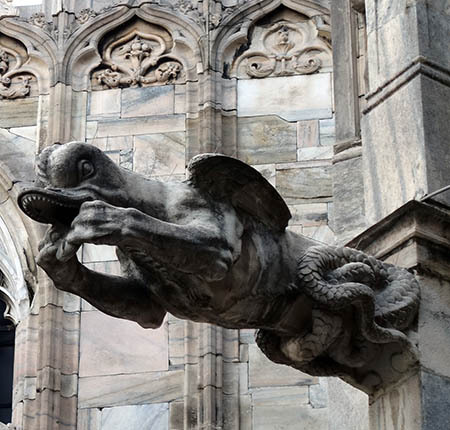 On a tight schedule, our next goal was the Milan cathedral, which is a 15-minute walk via the main shopping street. We saw this same setup in a few cities. The entire area was packed, because Italy was playing their neighbor, Croatia, in a Euro Cup qualifying game (fireworks thrown on-field, riot squads, delays, 1-1 result). Lots of checkered red-and-white shirts, chanting, singing, drinking. Here was also where we met the most dreaded Italians: the hawkers. Clouds of these people, who aggressively shove flowers, selfie-sticks, bracelets, and other knick-knacks into your face, swirl around the tourist sites and even inside restaurants. Even the people handing out comedy club cards in Times Square aren’t so aggressive. The cathedral, the largest in Italy, opens on a big square filled with Croatians. There was some kind of event here, complete with miniature net-covered soccer fields with 12-year-olds (they were bad). Thankfully, there was a short line for the cathedral, but we were faced with something new: soldiers checking the bags. At least, I think they were soldiers: they wore berets and camouflage, and seemed militant. The security was so severe that I felt like I was back in the US. The Milan cathedral is among the nicest I’ve seen, and we spent some time wandering around the inside. The highlight, to me, was a statue near the front, a solemn, muscular man clutching a book and swathed in a cloak. I was entranced by this statue, but something was off… it took me a while to realize just what was wrong with it. 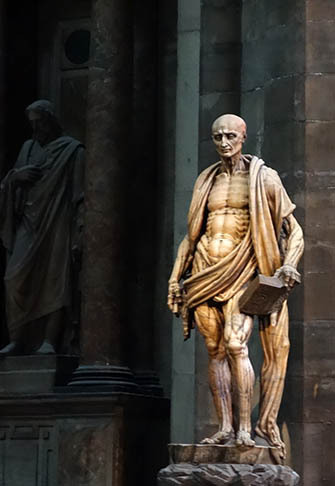 The subject, Saint Bartholomew, was one of the twelve apostles, who was martyred by flaying. So, that was no cloak – it was his own skin. A chunk of Old Saint Bart’s skin ended up in San Bartolomeo all’Isola, a small church we took refuge in during a rain shower in Rome. In a sad irony, Saint Bartholomew became the patron saint of leather workers. Who knew saints love Arrested Development? We wandered around the cathedral and found the line to go up to the roof (6 euros). The cathedral, right in front of us, was under repair. All the building restoration I saw in Italy was fronted with very classy facades around the scaffolding to obscure the construction. It was a thoughtful touch, except for the enormous animated Samsung ad in the middle. 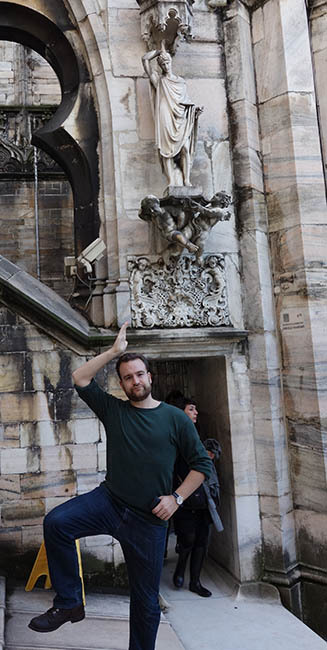 On the roof, we wandered through a forest of ornamental spires, gargoyles and saints. The view of the city is refreshing, and you can see the Alps in the distance (we’d also gotten a tremendous birds-eye view on the flight in). There were some nooks and crannies that offered a refuge from the crowds. Not to mention, a huge volume of bizarre gargoyles. One of my take-aways from the trip overall is that my knowledge of Christian iconography is woefully underdeveloped. I’m sure there’s an incredible backstory behind many of these saints, but all I can see are funny poses. Any recommendations where to start? After we came down from the roof of the cathedral, we took the subway to Milano Centrale, the central train station. Destination: Verona, for some much-needed rest and a night in a smaller city before heading to Venice. This entry was posted in Italy on December 13, 2014 by rob.